Silence is one of the most important parts of your retreat. It is only when you cease talking to others that you can hear the voice of God speaking to you. It is only in silence that you can mirror your soul and see where you are failing in your progress toward heaven. — from the Preface to the prayer book given to retreatants at Prouille, Elkins Park, Pennsylvania, in the 1950s. 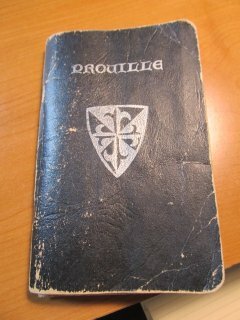 On July 11, 1958, my mother, Rose Yakimoff, accompanied by her sister, Mary McGroarty, arrived at the Convent of Our Lady of Prouille in Elkins Park, Pennsylvania, to undertake a weekend retreat. It was about 4:00 in the afternoon, time enough for them to get settled, freshen up a bit, and go down to dinner at 6:30. They would have an evening orientation, then a service of Benediction of the Most Blessed Sacrament, followed by the first presentation, a period of prayer and reflection, and then bed. Saturday and Sunday there would be meals, Mass, more presentation sessions alternating with periods of private prayer, and a private meeting with the retreat master, if desired (this was a preached retreat where all retreatants received the same content, rather than an individually directed retreat, shaped by a mentor according to the pilgrim’s immediate needs). The event would end at 4:30 on Sunday afternoon with tea and leave taking. I know the schedule because I have the 3×5-inch prayer book that my mother kept for the rest of her life (another 35 years). I know that the drop-off on Friday afternoon was probably about 4:00 because I was there. Somewhere, I have a picture of my mother and my Aunt Mary taken on the lawn of the retreat house and convent that Sunday, and when I find it (and I will find it, while I’m looking for something else, no doubt), I will post it. I remember the weekend so clearly because to me it was a great adventure. My father drove us the hundred miles or so from Harrisburg, “us” being my father, my mother, and my aunt in the front seat of our 1957 two-tone gray Ford Fairlane, and me (age 11), my sister (age 8), and my cousin Jim (Aunt Mary’s son, also 11) in the back. After the drop off, my father took us to the house he’d grown up in, not far from Elkins Park. His sister, Florence, lived there with her family and my paternal grandfather. The attic bedroom that my cousin Evelynne, a year younger than I, used became a dorm of sorts for us three visitors, Evelynne, and her younger brother Karl, who’d given up his bed to my father for the weekend. I remember a trip to an amusement park, an historic site or two, a haphazard schedule, and a lot of laughter. I can imagine now the scenario that led my mother to undertake a spiritual retreat. Driven by her grief and her guilt, she probably talked to her favorite of our parish priests, Father Fred. He probably recommended the retreat, and my mother persuaded her sister to go along. The grief and the guilt hit my father as well, and in the months that followed he spent more time with his own father, who would live six more years. I don’t know what effect the retreat had on my mother. That she kept the little prayer book all of her life certainly says something. The material it contains is very traditional, and the pattern of prayer it promotes — recitation of set prayers and litanies — is not very useful for me. (It appears to be a blend of Ignatian and Thomistic spirituality, heavy on the Thomism. I’m an Augustinian. You could look it up.) It’s quite possible that this kind of spiritual approach was all wrong for her personality type, but it would never have occurred to her to seek something different. I know that she continued to harbor what she called “regrets and recriminations” regarding her relationship with her mother, and I am afraid that she did not find much peace in this regard. When the book came into my possession after my mother died in 1993, I found tucked into it two memorial cards for her brother, Edward Dwyer, whom she adored (he was almost ten years older than she) and, quite curiously, the receipt for the purchase in October of 1972 of a White zig-zag sewing machine Model #1940 ($149.95, plus $10.95 for the carrying case), a gift to me when I undertook dressmaking lessons. The Convent of Our Lady of Prouille was a facility of the Dominican Sisters of the Congregation of St. Catherine de’Ricci. They purchased the 42-acre property from the Elkins family in 1932 to advance their mission of conducting retreats and spiritual education for laywomen. Over the years they added cottages, a chapel, a novitiate, a retirement center, and several outdoor meditation gardens. In 1953, 16,000 women made retreats there. But by the 1990s, the rising costs of maintenance on the facility and the needs of the growing community of aged sisters outpaced the growth of the congregation’s endowment and its fundraising efforts. The facility was sold to a developer. The last retreats were offered in 2007, and the sisters living in retirement there were relocated in 2009. I never got to visit Prouille at Elkins Park, to perhaps undertake a program there, to walk where my mother walked. I had planned to of course, and the day in about 2008 that I started the research into the possibilities, I came across the article on the Dominicans’ website announcing the sale of the property. What remains is the prayer book. In my belief system, I regard it as something of a sacramental. It contains some of the energy my mother put into it the weekend she received it, and to touch it and hold it is to be there again, waving goodbye to her as I headed off to a fun weekend of laughter, junk food, and low parental supervision. While I was writing this piece, a status update from my cousin Karl popped up on Facebook. He lives in Arizona, I have not seen him since the 1970s, and although we are Facebook friends, he does not use the site very much. There are vibes out there. Oh yes there are. Yes, there are vibes. Enjoyed this piece. I found your article while looking for the convent online after this week buying what is apparently the only available copy of the same prayer book that you refer to above. In the 1980s I studied painting and graphic design at Temple University’s Tyler School of Art, which bordered the property of Our Lady of Prouille in Elkins Park. The quiet and idyllic grounds of Our Lady made Philadelphia seem a thousand miles away. In all truth, we had no right to be on their property but they were kind and patient with our trespassing. Nearby, through the trees, was a large, gated seminary, which was already falling into some disrepair. Like the convent, the campus is gone — consolidated to the university’s main campus on North Broad Street. Thirty years have passed but it may as well be a hundred. I really enjoyed reading your article. Thank you for posting it.